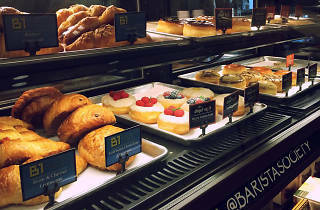 Photograph: Courtesy Barista Society Pastry case at Barista Society. Despite being housed on the second floor of Downtown's U.S. Bank Tower, the Barista Society isn't just for suits. 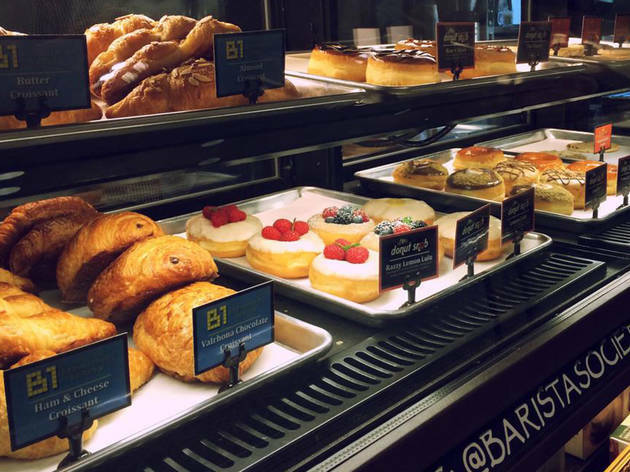 You'll find a little something for everyone here: donuts from the Donut Snob, croissants from B1 Bakery and coffee from Blue Bottle, Stumptown, Klatch and other quality roasters. Aside from the standard cups of cappuccino and lattes, there are harder-to-find options as well, like the 12-hour Kyoto-style iced coffee. Enjoy your order on the outside patio, where you can sit and watch those suits walking by all important-like. Tip: Park in the Central Library's parking garage, which will cost you $4 for three hours during library hours.